Portland, OR on Wednesday, November 7 in the evening. Boca Raton, FL on Thursday, November 8 in the afternoon/evening. Under the watchful gaze of his young assistant, and the threatening presence of a new generation of artists, Mark Rothko takes on his greatest challenge yet: to create a definitive work for an extraordinary setting. MGC Artistic Director Michael Grandage directs this first ever UK revival since directing the world premiere at the Donmar Warehouse in 2009. The production went on to win six Tony Awards, including Best Play. Award-winning stage and screen actor Alfred Molina reprises his critically acclaimed performance as the American abstract expressionist painter Mark Rothko. He is joined by rising star Alfred Enoch of US television drama series How to Get Away With Murder as his assistant Ken. 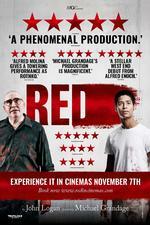 "The play offers an invigorating 90 minutes and shows Rothko’s ability to paint the town his own sombre form of red."